Hi and welcome to Rainbow Play UAE, I am Naomi Carr-Sutherland, founder of Rainbow Play Systems UAE. We are amazed that time has passed so quickly and we have now been distributing these great play systems in the UAE for 10 years. 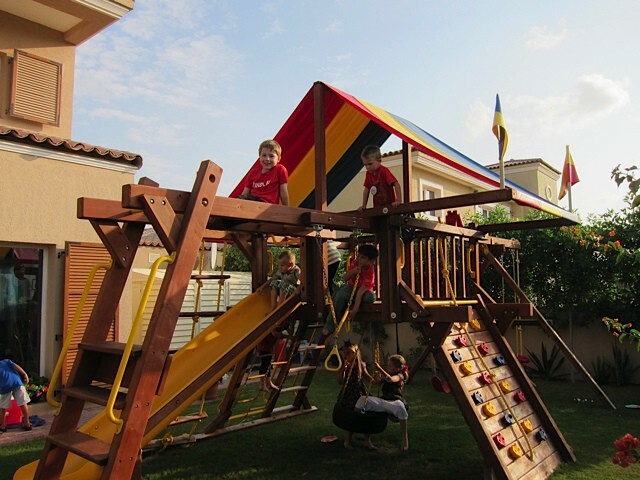 Becoming involved and being a distributor of Rainbow Play Systems here in the UAE was quite an organic process. Having lived in the UAE since 1996, I have seen the harsh effects of this climate on outdoor products and I knew that what I wanted to purchase would have to be of extremely high quality to withstand the climate here. There were other requirements too – flexible, modular, free-standing and safe to name a few. In 2009 there wasn’t anything that I could purchase locally in the UAE that fitted these requirements. As a result we took steps to import a Rainbow Play System from the USA and believed that there were other families like us that would want the same and we took the steps to supply other families here in the UAE with this great product. Over the last 10 years we have evolved to a known household name in the UAE and most people know of or have seen our product for themselves in a friend’s or a relative’s garden and they have their own children asking for a “Rainbow” of their own. Along with the good quality product, we offer personalized help in choosing your Rainbow, we are more than happy to sit and meet you to discuss your requirements based on my knowledge of the product and the fact that our three children, now 12 and 10, use our Rainbow Play Systems daily. I know what they like and don’t like and at what age they have mastered certain activities. It really has been one of the best investments that we have made for our children and it makes it a pleasure to provide a product that I truly believe in. I look forward to helping you choose your Rainbow soon! Download our Rainbow Play brochure to see our full range of Castle Swings Sets for your child’s play area. Call us to book a meeting with one of our specialist sales team to organise a demonstration of our slides. Have any questions? Get in touch with us today and we will help you with with all your questions or queries.